Stress is common and unpredictable. We can all find ourselves unexpectedly in a stressful situation at work. One minute everything is fine and the next BAM. But how we deal with the situation can determine the outcome. There are two possible outcomes. First, the stress can accumulate over a period of time and increase the risk of developing burnout, or even anxiety or depression. Second, with the right support and training we can learn how to deal with certain situations, view them as a learning opportunity, rather than a personal attack, and we can grow. When you find yourself in a stressful situation do you look for the cause of the problem or a solution? It can be incredibly difficult to try to find a simple solution with someone who is distressed. And in fact you may find yourself becoming stressed, particularly if they are blaming you for the sequence of events which occurred in their lives. It could be a resident who is having hard time adjusting to living in care and shouting at you “you don’t know what it is like to live here”, it could be their relative who is not happy with some aspects of care “why is my mum not having prunes with her breakfast?” or it could be another staff member who is not pulling their weight “no, you do it”. Regardless of who is involved in the interaction with you, it can be upsetting. If we look for the cause of the problem we need to become a bit more analytical and explore what is going on for the other person and why they are reacting in such a way. Is it their stress levels? Is it their mental health status? Are they experiencing sensory or cognitive changes? Are they having difficult time in their lives and not coping? If you do not address the stress you are experiencing in your workplace you can start to feel isolated, withdrawn and not your usual self. It can be difficult to keep smiling when you are upset. It can be even more difficult to support clients when you are not feeling well yourself. If a client asks you why do you seem unhappy and what is troubling you what do you say? Where do we draw the line between discussing our own emotions and yet speaking openly to clients about their emotions? Maintaining professional boundaries is important but knowing how to go about it in a practical sense can be a challenge. Here’s what I want you to know. 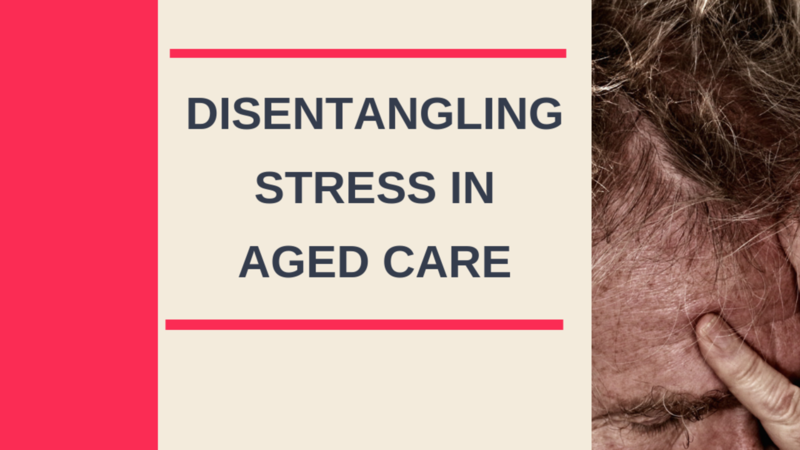 Every aged care professional experiences some type of stress in their role. But, it is how we deal with the challenges that differentiates those who are stressed from those who are resilient. This is a skill which needs to be built over a period of time. Similarly, it is also a skill to recognise mental health changes in your clients and stress levels in their families. This is not just common sense or something that we automatically think we do. This is something that requires latest evidence-based skills and implementation. What I want you to do now is download my quiz – Emotional and Psychological Wellbeing in Aged Care. The quiz will help you identify what is going on in your facility when it comes to identifying the source of stress. Once you do that you are already two steps ahead and can identify what needs to be done to improve wellbeing. It could be screening resident mental health, delivering innovation in wellness programs, supporting families or upskilling the workforce. Workers can only deliver the service to the level of their training and support. This is where I can come in and help. I run an online course, in person workshops, coaching and consulting to help improve mental health outcomes in aged care and achieve fulfilled residents, resilient employees and satisfied families. Once the workforce is upskilled we can reflect on the progress and the journey to achieving better mental health outcomes in aged care facilities.